I've been working through some ideas lately. Some of this stuff I've been dreaming about for a couple of years and I'm just now able to make it happen. My original idea for the O ring retention system kind of morphed into something else and I'm very pleased with the results. It's interesting how these ideas evolve and take shape and it's a lot of fun for me to go through the process. It's especially good when I can finally get to a finished design. 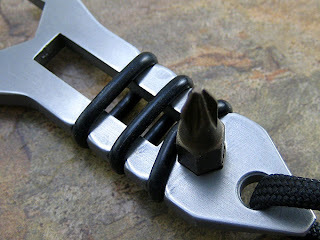 The BottleBug tool features a 1/2" wrench opening in the bottle opener area and a small pry tip/screwdriver. 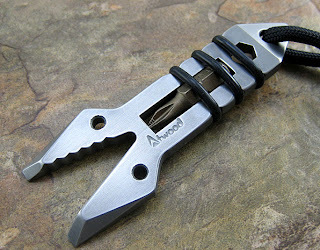 The Crawdaddy tool takes the concept even further. It is loosely based on a late 19th century or early 20th century antique wrench tool that a good customer sent me for my collection. The antique tool had machine filed teeth and showed evidence of crude forging. I updated the design considerably and limited the sizes to just six: 1/4, 5/16, 3/8, 7/16, 1/2 and 9/16. The two holes where his "eyes" would be are sized for a bead chain for a convenient neck carry option if desired. 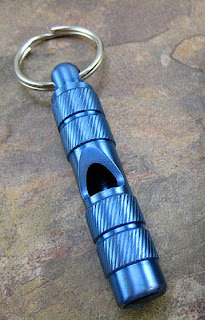 The Crawdaddy is just over 3 inches long so it will ride well on a keychain or in a pocket too. One of the things I like about this series is that you can store any standard one inch long 1/4" hex bit that you want. So if you want Phillips you can have it. Square drive, Torx in any size, 1/8" hex if you want one for your Strider pivot, tamper proof bits of all kinds. There are literally dozens to choose from but I will be supplying a nice USA made #1 Phillips with these. 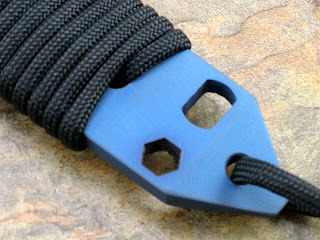 The O rings keep the bit plenty snug and the bit is accessible from either side so the tool is ambidextrous. The last O ring partially covers the 1/4" hex opening and so when you stick the bit in the hole, again from either side, the tension from the O ring holds it in and keeps it from falling out on the floor. 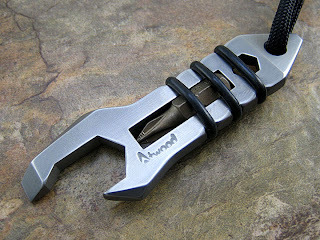 The bits are easy to slip in and out of the handle "breech", and indeed it kind of reminds me of sliding a shell into a rifle or shotgun. Title says it all. I haven't forgotten about you all, just plugging away. It seems like I'm kind of stuck in a cycle of making without actually finishing anything. Hopefully the payoff will be a whole lot of stuff this fall. I have some new items up my sleeve that I'm anxious to share with everyone but not quite ready....stay tuned. Regular Mini Keytons will be back this week. It's cooling off here for a few days so I'm torn between working and playing. The playing part has been really good and I'm happy to report that there are some really nifty brand new tool designs that will be coming in a 2-3 weeks. These are related to my previous offerings but are also very different. Stay tuned! Spannerbabies of any kind are permanently discontinued. I've made quite a few of them and it's time to move on. I cannot possibly make everything in my lineup as it is and so I'm going to be making room for new items. 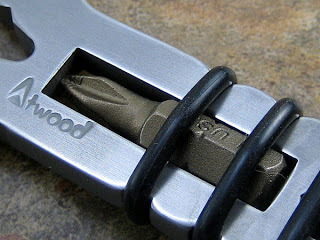 There are other makers out there who are working on new spanner tools and I'm sure they will be offered soon. Shot glasses are still in the works but are being delayed a little longer. I had the choice last week to start working on them or make another run of titanium whistles so I chose whistles this time. Hopefully they will be done in a more timely manner than the last batch! I never did get the marking issue resolved with them but it really doesn't matter....they are simply gorgeous in person and ultralight weight. There are still a couple left from the current batch so please email me if interested. I'm working on a small batch of Hexbabies which will hopefully be ready mid week. For tomorrow I am just finishing a very small batch of 3V steel Bug Out Bars and Micro Bug Out Bars. The next batches of these will be in titanium and will be similar to the one shown below...those will be available in a few weeks. Trying to get to more whistles this week and also the last of the talonite MSOPThings. Should be less distractions this week and I'm feeling a little better so more will get done this week I think. In the meantime, here's a prototype for those of you looking for a little eye candy. :) I hope to do some of these in September. 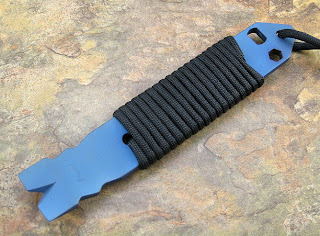 Full sized 6" x 1" x 3/16" thick titanium Bug Out Bars with O2 cutout for first responders and 1/4" hex drive hole. With the recent batch of Keychain Edition Prybabies I have several people write and ask if they received the correct one. I have increased the size of the Keychain Edition Prybaby slightly in this last batch and it is now 10% smaller than the Original, rather than the earlier batches which were 15% smaller. Thus, the new Keychain Prybaby is 2 7/8" long compared to 3 1/8" long of the Original. It is not a lot but I felt that the first batches were a touch too small and my intention was that I wanted to give people what I feel is the best product that I can make. My apologies if some feel they are not small enough.